There is a deep and wondrous mystery about the love affair between bees and bluebonnets. It begins with the mean air temperature ranges in the late winter and early spring months. Our two most popular bluebonnet species in Texas begin to bloom in large numbers in mid-March through into late April. It just so happens that the mean temperature range during this time is below or just at the low end of the optimal foraging temperatures for most butterflies. However, the mean temperature range during this time is ideal for most bees. In early spring (mid-March to mid-April) you will find more bees than butterflies. Then there is the color of the bloom. Both bees and butterflies can see ultraviolet colors, but it appears that bees prefer blue and yellow flowers and butterflies lean more towards brightly colored flowers like flowers with shades of red and yellow. In early spring, there are more blue – violet flowers. In late (May into June) spring there are more red and yellow flowers which are more suited to butterflies. And how about the shape of the bloom? The shape of the bluebonnet fits the bee and not the butterfly. The lower two wing petals on a bluebonnet bloom form what some call a keel like or boat like shape. This is a hidden compartment containing the precious nectar, and the bee knows about it. The bee is able to land on this "keel" and pull it down to get at the nectar. When the bee pulls down the keel this puts the pollen covered parts of the bloom in direct contact with the body of the bee. Butterflies prefer flowers with larger landing platforms. Now about that spot! On the top bonnet-like banner petals of the bluebonnet bloom there is a patch of white. This patch is a guide to the bee to where the best and freshest nectar is located for the taking. It is a common myth and misconception that this white patch will turn a purplish-red color when the bloom has been pollinated. However, studies have shown that the white patch turns red due to the age of the bloom and thus the viability of the pollen in the bloom. The bee has this knowledge in its genes, so it will avoid the blooms with the reddish patch and go for the ones with the white. Important Point: The bluebonnet is not self-pollinating, so it needs pollinators to survive as a species. And since its main and likely only pollinator are bees then: No bees – No bluebonnets. 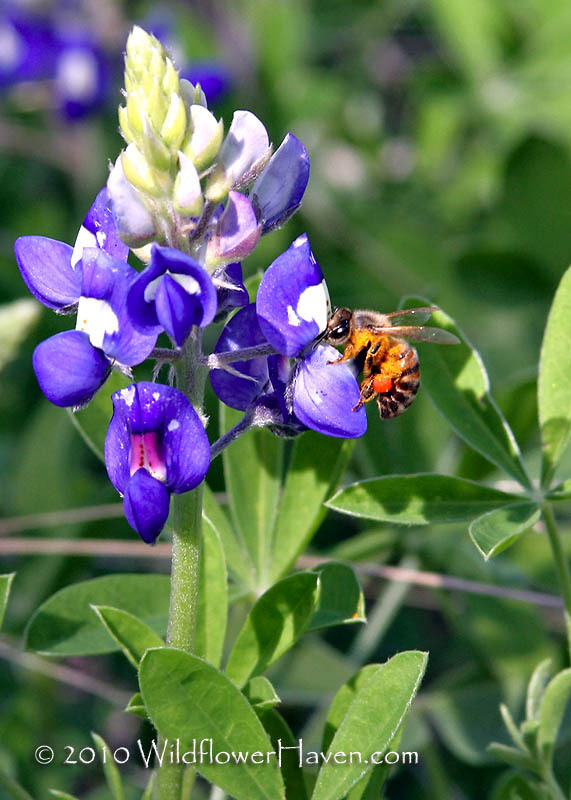 How did the bluebonnet develop knowing bees would likely be the only pollinators in the early spring to pollinate its blooms? How did the bluebonnet know how the bee was shaped so it could shape its bloom in a way to impart its pollen correctly? And how did the bee come to know the bluebonnet’s secret hiding place for its nectar and that the blooms with the white patch have the freshest and best nectar? Here is a 5x7 image for you to print at home or share with others. Permission is granted to make 10 prints from this image for home use only - no commercial use is allowed. Click on the image to get to the full size 2100x1500 pixels image for printing. Do Not print from the image displayed.